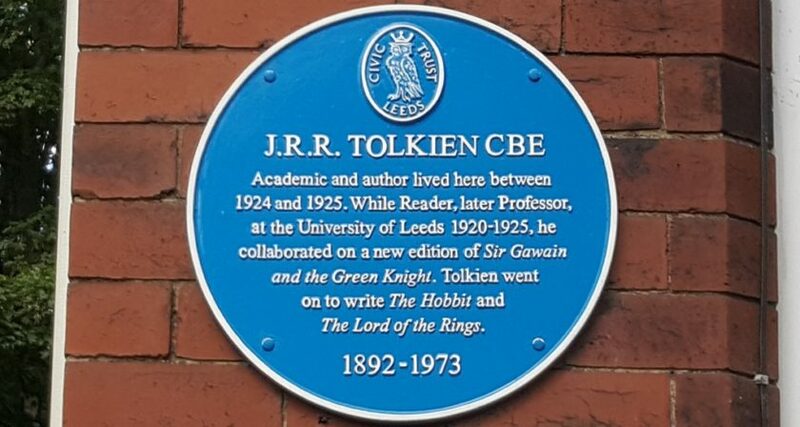 Leeds was Tolkien’s home 1920–25. Between 1924 and 1925, Tolkien and his family lived at 2 Darnley Road, West Park, Leeds. The Tolkien Society Seminar 2018 will be held on Sunday 1 July in Leeds at the Hilton Leeds City. The theme this year is Tolkien the Pagan? Reading Middle-earth through a Spiritual Lens. Brad Eden Tolkien the Buddhist: Reincarnation, Inherited Memory and Theosophy, oh my! The Tolkien Society Seminar is a one-day conference of academic of talks and panel discussions on a specific theme. Held most years since 1986, the date and venue used to vary each time, but it is now held in Leeds on the Sunday before the start of the International Medieval Congress (IMC). This year’s Seminar is a greatly anticipated day of papers exploring spirituality in Tolkien’s universe and reading his work through a variety of religious lenses. Looking beyond Tolkien’s claim that The Lord of the Rings is “a fundamentally religious and Catholic work“, the Seminar will examine how the readers’ spirituality shapes their understanding of Tolkien’s writing and how Tolkien’s fiction shapes their spirituality. An informal innmoot—a visit to the local pub—will be held on Saturday 30 June from 7pm at the Scarborough Hotel. Registration opens at 9am on Sunday morning with coffee and pastries. A buffet lunch will be provided at midday. The day will conclude at approximately 5.30pm. Visit Dr Dimitra Fimi’s blog for more information. Registration costs £25 for members and £30 for non-members, and includes refreshments throughout the day and a buffet lunch. The hotel is roughly three minutes from Leeds train station. Leave the station via the main exit near Marks and Spencers. Cross the road via the pedestrian crossing and go down the staircase to the right of the taxi rank. At the bottom of the stairs take a right and continue along the road and under the recently refurbished railway bridge. Hilton Leeds City is located approximately 200m on the right.